Look like a card cheat without years of practice, self-denial, cheap bourbon and wild women. The most impressive thing you can do with their deck - the one they just handed you - is to discover the four aces in a variety of astounding ways. And it's even more impressive if they tell you which ace to find each time. Now you can do that with a couple of simple, beginner-level sleights. And you can do it impromptu with their deck. Sure, this has been done before, but those methods required hard work, difficult sleights and mind-numbing mental calculations. 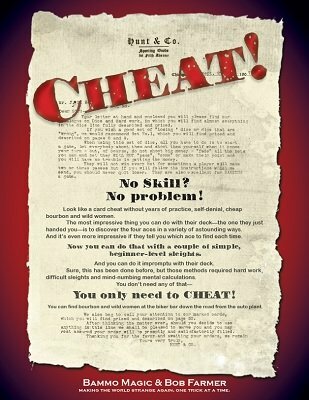 You don't need any of that - You only need to CHEAT! You can find bourbon and wild women at the biker bar down the road from the auto plant. Also check out Cheat! The Prelude , the perfect lead in to Cheat! 1st edition 2018, 29 pages.